Please scroll down for a list of party offerings. 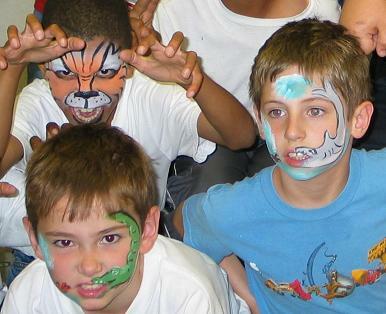 Each party guest will get a full WOW face painting of their choice. Please inquire for a price quote based on your party needs. Each party guest will get a custom painted or stenciled temporary ink tattoo or glitter tattoo of their choice, as well as an adhesive-backed tattoo of their choice (hundreds of styles to choose from). All tattoos can be removed with 91% alcohol or baby oil. Each party guest will get a custom henna design of their choice as well as a beautiful bindi jewel of their choice (Ask about a Glitter & Bindi Party for those who only want glitz for a day without a longer lasting henna stain). This party requires a MINIMUM of two weeks notice, as fresh henna paste will have to be prepared. Please be aware that henna usually lasts about two weeks, and cannot be removed before that time. I WILL NOT use black henna, so do not even try to request it. The product referred to as �black henna� is VERY dangerous, and should NEVER be used on skin. Please see my safety page for more information. Each party guest will get to participate in craft activities customized for your event, as well as getting to take their craft home as a souvenir. Craft Parties must be booked a MINIMUM of 6 weeks in advance so I can order supplies if necessary. These parties can be for boys, girls, or a combination and can be customized to suit your party or event theme. Adults will need to be present to assist with the craft activities. Your party guests will participate hands-on in CRAZY science experiments led by the CRAZY SCIENTIST, as well as getting to take home a cool souvenir. These parties must be booked a MINIMUM of 6 weeks in advance so supplies can be ordered. Adults will need to be present to assist with the experiments. Customize Your Own Party: Tell me what services you would like at your party, and we can mix and match to suit your needs and design a custom party package just for your event. Costumed characters are available for your party!!!! Available characters include Snow White, PIP-POP the Clown, Pirate, Witch, Angel, Butterfly Princess, Creepy Creature, Crazy Scientist, or Holly the Elf. Sandy Candy is the sand art you can eat!!! This is available in a variety of colors and container shapes. Click on the Sandy Candy link in the photo gallery for more information. Please specify the container of your choice at time of booking. Storytelling is available for groups of smaller children. Let me customize a story for your party!!! Party Favors can be provided for your guests to suit the theme of your party. Advanced notice of AT LEAST one month is required for party favor bags, so supplies can be ordered. Specialty Cakes can be ordered to suit your party theme. Please see the Specialty Cake section of the Photo Gallery for examples of my cakes. I need AT LEAST two weeks notice to prepare a cake for your party, as I custom design each cake and want ample time to prepare. Please inquire about cake prices when booking your event.